While the rest of the world is obsessed with soccer and cricket, a handful of children coached by Sushan Thapa in Karate kids club are identifying their passion in the field of martial art where they don’t fail to bag medals when they return from any competition like they won 4 medals in 3rd North-East India Karate-Do Championship2015 which was held on 28th-29th March in Nehru Stadium, Guwahati, Assam. ‘44 children under the banner of Karate Kids Club (KKC) represent Darjeeling Gorkha karate-Do Association (DGKA) when it comes to performing in a competition’ said the chief coach. Without distracting their regular studies, the children practice their art with enthusiasm only on weekends, informs Thapa who is also the secretary of DGKA after KKC. DGKA is an organization which was formed in 2011 with the motive to promote and develop Karate as a significant sport in the Hills. However, in the last competition which was organized by North-East State Karate-Do Federation of India (NESKFI) and hosted by United karate-Do Association Assam, 4 children out of 12 participants from Darjeeling Gorkha karate-Do Association acquired different medals. Meanwhile the children are practicing for their upcoming competition which is likely to be held in Delhi soon. 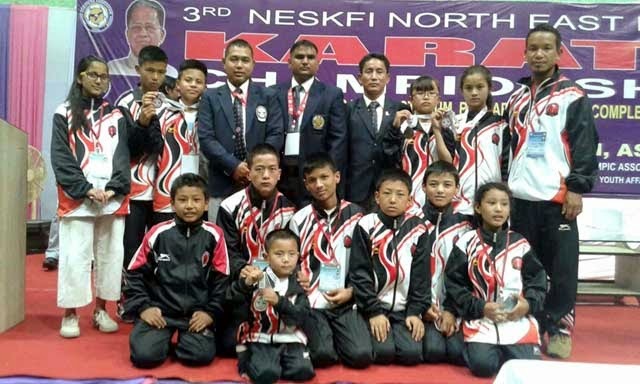 Darjeeling Karate kids bags medals in North-East India Karate-Do Championship 2015 Assam, ‘44 children under the banner of Karate Kids Club (KKC) represent Darjeeling Gorkha karate-Do Association (DGKA) when it comes to performing in a competition’ said the chief coach.